To truly understand the violin, one must understand the history of the violin bow. While the bow appears utilitarian in nature, it is anything but plain. The evolution of this simple piece of wood and horsehair is quite fascinating, spanning centuries. From the simple piece used in the middle ages, to the artistic renderings of the Baroque-period, and the ergonomically-adept Classical bow, the history of the violin bow is anything but dull. The instrument’s rudimentary beginnings date back to the Byzantine Empire, around the mid-fifth century. 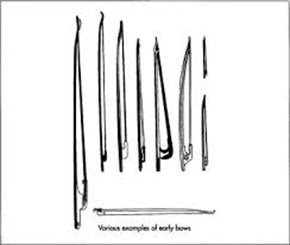 Much like the archery bow, early violin bows were quite convex. Horsehair was fastened directly to the stick, without consideration for tension. This basic bow remained unchanged throughout the middle ages. Shorter in length, usually 8”-12”, the history of the violin shows early versions of the instrument were predominantly used to keep time on the dance floors of weddings and festivals, and the shorter bow required a closed fist, or underhanded, method of playing. Upon development of the modern violin, in the 17th century, the bow began to change. Adjusting tension of the hair held some interest and improvements were made to mechanize the adjustments. Initially, tension was altered by modifying their grip, e.g. by applying pressure with the thumb. Later, a detachable frog was developed and finally, a button and screw adjusted the tension of the hair. By the late 18th century, the bow was again transitioning. More and more pieces were composed for soloists and, in order to hold its own in the concert arena, the violin needed a more assertive sound. The bow would need to allow for these more powerful pieces through its construction and versatility. Soloists and Virtuosi of the day played a major role in development of the Classical bow. Changes were made to strengthen the violin bow by improving the breaking strength and including a metal underslide, which helped to stabilize the weak points of the Baroque bow. The modern violin bow is the result of the mathematical applications of Francis Xavier Tourte. Tourte, essentially the father of the modern bow, took the bow to a new level by making it stronger, introducing changes to the shape of the stick, and improving the mounting for the wider, thicker horsehair. The balance of Tourte’s bow allowed for a quick response, which broadened the versatility of the instrument itself and introduced new techniques. Today’s Modern bow, like its early prototypes in the history of the violin bow, is made primarily of hardwood, brazil wood, and pernumbuco. Students of the violin typically utilize the composite bows, which are made of fiberglass and carbon fibres, offering more affordability when they are starting out. The use of these materials is partially a response to the shortage of good pernambuco.